He was born in Myrhorod, Poltava region, Ukraine. His father, Yeḥiel-Mikhl Halevi, was a well-to-do and eminent Hassid of the Chabad sect and simultaneously also a follower of the Jewish Enlightenment, and he gave his son both a traditional Jewish as well as a worldly enlightened education. As a youth, Gordin received his education at home with itinerant teachers and tutors. He studied Hebrew, Russian, and German, and on his father’s shelves of religious texts he discovered a few things that made a huge impression on him: the Russian translations of Edward Bulwer-Lytton’s English-language novel, What Will He Do with It?, and François Fénelon’s French novel, Les aventures de Télémaque (The adventures of Telemachus). He also found in his home the progressive Russian journals, Sovremennik (Contemporary) and Syn otechestva (Son of the fatherland) as well as Hebrew-language Enlightenment pamphlets. Around 1870 he began writing for the Russian press, and he was a frequent contributor to the south Russian newspapers, Odesskii vestnik (Odessa herald), Golos (Voice), Novorasiskii telegraf (New Russian telegraph), and Pravda (Truth). He was a member of a “circle of Little Russia” which set as its goal to liberate and detach “Little Russia” (Ukraine) from Russia. He mastered Ukrainian at the time, and even began to translate into Ukrainian the first chapter of Marx’s Das Kapital. In the Russian-language organ of his group—Zarya (Dawn)—he also began to write fiction. At age nineteen (in 1872), he married a young woman from a rich family and was compelled to make a career as a businessman, but as a dreamer and “enlightened” moralist with “populist” tendencies, he could not adapt to this life. He soon abandoned his dowry and found himself without a means of making a living. Gordin lost himself “across the world” and in his wanderings tried out various pursuits. He worked as a farmer, a stevedore at the port of Odessa, and an actor in a traveling Russian troupe. He later settled in Elizavetgrad. There he worked as a teacher in a Russian Jewish school (known as the “Russified Talmud-Torah”). For a time he also lived in Odessa. In both cities he took part in the world of journalism. He also wrote short stories and sketches, portraying in them images of real Jewish and Gentile lives. In 1880—using the pseudonyms “Yakov Mikhailovitsh” and “Ivan Kolyutshy”—he began to contribute to the progressive St. Petersburg journal Nedelya (The week) and to the southern newspapers Odesskie novosti (Odessa news) and Yelizavetgradskii vestnik (Elizavetgrad herald), and on these two newspapers he served for a time as unofficial editor. He published in Nedelya a series entitled “Types of Shtundists” [sectarian Christians]. He also wrote theater criticism, often changing his pen names: Kolovrat, Alfey, etc. Also belonging to this phase of his career was the violent chapter of Gordin’s life tied to the sect known as the “Biblical Brotherhood.” In Elizavetgrad, then the center of the Russian Shtundists, Gordin had the opportunity to get to know quite well the people and ideals of this rationalist Evangelist sect which rejected dogmatic ritual in religion, built their faith on principles of humanitarian ethics, supported social equality, publicly opposed commercial exchange, and strongly believed in labor—especially, work on the land. The ideals of the Shtundists as well as their private lives greatly appealed to Gordin, and being a man of impetuous temperament and enormous energy, he decided to carry forth the principles of Shtundism into Judaism, to reform the entire Jewish way of life, and to transform the Jewish religion into a rationalistic, ethical-social teaching on the foundations of a pure biblical Jewishness. In January 1880 Gordin and a few of his adherents founded in Elizavetgrad the “Spiritual Biblical Brotherhood,” and some thirty people joined. They were popularly known as the “Bibleytses” or “Shtundares.” In 1881 the Brotherhood worked out the principles of its program, the essence of which were: religion is recognized only as a complex of ethical norms. They disavowed all religious dogma, as well as the immortality of the soul, repudiated religious ritual, including the wedding ceremony and that of circumcision, renounced the Talmud, and adhered solely to the Tanakh which they interpreted freely, all in the spirit of the times and of science. The Jewish population initially viewed the new sect with suspicion, but it became ever more hostile, especially—as was the case for Gordin—a short time after the April pogroms of 1881, when he wrote under the pen name “Brother in Bible” and published in the Kharkov Russian newspaper Yuzhnii krai (Southern frontier) a letter or an appeal “To Brother Jews,” in which he wrote that Jewish “monetary greed, sliminess, nerve, usury, trickery, and brokerage have brought the Russian people against us,” and to be rid of this hatred, the Jews needed to “yank out the rotten teeth with which they bite others and from which they suffer themselves.” His appeal ended with the turn of phrase: “Brothers, awaken and begin a new life.” This call provoked fury in the Russian Jewish press of the time and bitterness in the Jewish community. The Brotherhood disintegrated soon thereafter, and a number of its members began to agitate for emigration to the United States. Gordin fought against them. He left for a village in which he worked for three years on the land, living the life of a simple farmer. In 1884 he returned to Elizavetgrad and, together with Anna Pokrasova and Gr. Bernshteyn, rebuilt the Biblical sect which was legalized in 1885 by the authorities. Every Shabbat in their “prayer house” they would explicate passages from Tanakh in the spirit of Tolstoyism. Gordin had enormous success at such meetings with the power of his oratory. And, even with his deep, warm interest in the poor, unenlightened Jewish folk masses, Gordin was nonetheless still unable to bolster the Brotherhood, though he did succeed in founding in Odessa a circle of Shtundares, which Moyshe-Leyb Lilienblum would often criticize for its sectarianism, charging it with impure ulterior motives and aspirations to detach itself from Judaism and reach for bourgeois equal rights (Lilienblum also fought against Gordin’s sect in the columns of Razsviet [Dawn] and later, after Gordin’s death, in Fraynd). Gordin made subsequent efforts to spread organizationally the activities of his sect, but without success. The government began to persecute the sect, and in 1891 he was himself compelled to emigrate to the United States. He had a plan to found a colony on a communistic basis in the New World, but nothing came of it. On July 31, 1891, Yankev Gordin arrived in New York with his wife Anna and their eight children (she was pregnant at the time with their ninth). Precisely a month later, another child was born, and she would later give birth to another five—altogether she and Gordin had fourteen children. Soon after disembarking from the ship, Gordin joined the Jewish socialist colony in New York. Following the advice of Jewish socialists (especially, Philip Krantz), that the great majority arrived in America with their homely Russian and then switched to Yiddish, Gordin left with the same plan, and on August 21, 1891 he published in the New York socialist weekly Di arbayter tsaytung (The workers’ newspaper) his first item in Yiddish: ostensibly an extract from a letter about the three-day “pogrom in Elizavetgrad” in April 1881. The “letter” was signed “Yankev ben Mikhl.” Two weeks later in the same weekly, under Goldin’s full name, he published “Di oblave, oys dem idishn lebn in rusland” (The search, out of Jewish life in Russia) and one week later his humorous story “Pantole polge farn bezdn shel mayle” (Pantole Polge before the court on high) which was based on a theme similar to “Bontshe tsvayg” (Bontshe the silent), and later, in adapted form, it was frequently recited and performed by Yiddish actors on the theatrical stage. Thereafter in six issues of the newspaper, there was published his longer work, Vi azoy ikh bin gekhapt dem glik farn ek (How I seized happiness by the tail), “a tale of a Russian Jew.” Gordin even wrote impressions of Jewish workingmen’s lives in America, but he was more than anything else drawn to themes of life in the old country, which he depicted in short pieces and stories and also in his larger work, Di tsebrokhene harts (The broken heart), “a novel of Jewish life in Russia,” which was published serially in the same weekly. Yet, all of this could not by far suffice to maintain the well-being of his large household, and he sought out various means and ways of improving his difficult material condition. According to Hertz Burgin’s Di geshikhte fun der yidisher arbayter-bavegung in amerike, rusland un england (The history of the Jewish labor movement in America, Russia, and England) (New York, 1915), p. 321, he was obliged to try to publish (with Yitskhok-Ayzik Hurvits, in 1891) a Russian newspaper, Progress (Progress), but without success. Kalmen Marmor recounts in his book, Yankev gordin (Yankev Gordin), that he “did not succeed in devising such a newspaper, but only produced a description of it.” A short time later, after he had begun writing plays for the Yiddish theater, Gordin was the editor of the Russian weekly newspaper Russkie novosti (Russian news), published in New York from January 1 through September 3, 1893. There—writing under the pseudonyms Yan, Gordenko, Mikhailov, and Yankel Mikhelevitsh, among others—he wrote articles, notices, feature pieces, sketches, studies, and a treatise on a longer theme entitled [in English] “With Tolstoy in the Russian Famine,” as well as a translation of Ernest Renan’s Histoire du Peuple d’Israël (History of the Jewish people). This newspaper lasted until issue 37, and due to financial difficulties then discontinued publication; Gordin then parted ways permanently from efforts to write in Russian in America. In the last months of 1891, Philip Krantz proposed to Gordin that he write a play for the Yiddish theater, and to this end he brought Gordin together with the celebrated Yiddish actors, Yankev [Jacob] P. Adler and Zelig (Sigmund) Mogulesco. Gordin was just then working on his Russian newspaper, in which was described a story about someone deported to Siberia who subsequently escaped and was caught and sent back. “Here is the plot for a play”—Gordin said to Adler, and thus was born the play Sibirya (Siberia), for which Gordin received $100 (according to Z. Zilbertsvayg, Leksikon fun yidishn teater [Handbook of the Yiddish theater, vol. 1 (New York, 1931)]. Sibirya, “a living picture in four acts with a prologue,” was first staged on November 13, 1891 in Union Theater, and with it a new chapter opened in the history of the Yiddish theater. The play was never published as such. Nor, for that matter, did it raise such a great stir among the usual audience. It did, however, bring to the theater people such as had not as yet been seen there. Intellectuals began to go to Yiddish theater. Barely two months later, Gordin’s second play (also never published), Der pogrom in rusland (The pogrom in Russia), was staged in a second theater. In this play he also acted in the role of a Russian pristav (Tsarist police commissioner), because there was no actor in the troupe appropriate for the part. The two plays brought Gordin considerable recognition in the world of Yiddish theater, especially among the better Yiddish actors. When a group of the most eminent Yiddish stage actors (Yankev and Sarah Adler, Kenny Liptsin, and both of the Zilbermans) in 1892 joined together into a single troupe at Union Theater, they invited Gordin to be the playwright for their troupe and—according to the practice then current—placed their name over that of the theater itself. From that time forward, Gordin remained until the end of his life connected with the Yiddish stage, for which he either wrote or adapted, or simply translated from another language, three or four plays each year on average. In all, over the course of eighteen years of his playwrighting activities, he composed some 70-80 works. The majority of them had no enduring value and were never published. The better, original dramas did appear in various editions in New York, Warsaw, Przemyśl, and elsewhere. In virtually all of his plays, either the idea of it was taken from a well-known writer, or the entire plot line was borrowed, or it was simply a translation of a noted theatrical work. Oftentimes, the title was merely Judaized. Yet, a Jewish way of life. For example, Der idisher kenig lir (The Jewish King Lear) of 1892 has both its title and a portion of its plot take from Shakespeare; Di litvishe brider lurye (The Luria brothers from Lithuanian) and later Di gebrider lurye (The brothers Luria) of 1894 were built on the plot line of Shakespeare’s Romeo and Juliet; Der shvartser id, oder meyer yuzefovitsh (The black Jew, or Meir Yuzefovitsh) of 1895 was an adaptation of Eliza Orzenszkowa’s Meir Ezofowicz; Medea (Medea) of 1896 was a simple translation of Franz Seraphicus Grillparzer’s work; Forverts (Forward) of 1896 was a translation of a work by Sergey Mikhaylovich Stepnyak-Kravchinsky; Shloymke sharlatan (Shloymke, the charlatan) of 1896 was an adaptation of Alexander Nikolayevich Ostrovsky’s Bednost ne porok (Poverty is no disgrace); the opera Hernani (based on Victor Hugo’s drama [and Verdi’s opera]) emerged from Gordin as Kol shoyfer (The voice of the shofar) in 1896; Dvoyrele meyukheses (Dvoyrele, the aristocrat) of 1897 was adapted from Ostrovsky’s Grakh da beda na kogo ne zhivyot (No one is born in sin and sorrow); Reyzele, oder zelig-itsik der klezmer (Reisele, or Zelig-Itzik the musician) of 1897 was an adaptation of Friedrich Schiller’s Kabale und Liebe (Intrigue and love); Di shlekhte pastukher (The bad shepherds) of 1899 was a translation of Octave Mirbeau’s Les mauvais bergers; Di idishe geto (The Jewish ghetto) of 1899 follows closely Israel Zangwill’s Children of the Ghetto; Di shvue oder ronye di potshterke (The oath, or Ronye the postman) of 1900 was drawn from Gerhart Hauptmann’s Fuhrmann Henschel (Drayman Henschel). Even in his Di shkhite (The [ritual] slaughter) of 1900—with its rabbis, ritual slaughterers, and scholars—there is a scene taken from Ostrovsky’s Ne tak zhivi, kak khotshetsa (Don’t live as you like). And, even in his most original plays—such as Mirele efros (Mirele Efros, 1898), Got, mentsh un tayvl (God, man, and devil, 1900), Safo (Sappho, 1900), D kreytser sonata (Kreutzer Sonata, 1902), Khasye di yesoyme (Khasye the orphan, 1903), Der unbekanter (The unknown man, 1905), Der meturef (The madman, 1905), Elishe ben abuye (Elisha, son of Abuya, 1906), and On a heym (Homeless, 1907)—one finds distinct influences from other well-known literary works, unquestionably drawn in significant number directly from translations and non-Jewish writers, such as: Maxim Gorky’s Meshchanye (Philistines), Deti solntsa (Children of the sun), and On Deck; Hauptmann’s Rose Berndt and Vor Sonnenaufgang (Before sunrise); Tolstoy’s Vlast’ t’my (The power of darkness); Henrik Ibsen’s En folkefiende (An enemy of the people); and August Strindberg’s Fadren (The father). Out of material need, Gordin also wrote (occasionally under the pen name “Professor Yakobi in London”) plays of low artistic quality (shund or literary trash), dubbed “musical comedies” and operettas, such as the “historical opera” Di sheyne miryem un di gepeynikte (Beautiful Miriam and the tormented one) of 1900, according to A. Sh. Fridberg, Emek Haarazim (Vale of cedars). Gordin’s plays eliminated the wildly Germanized Yiddish that until him dominated the Yiddish stage, and he taught the actors to speak in a plain, natural Yiddish. While even Gordin did not understand in his own writing the distinction between Vilna Yiddish and his own stiff Elizavetgrad Yiddish, he still understood to be fastidious so that “Zelik-Itsig, the musician, and Nokhemtse, son of Devoyre and an itinerant teacher, Hershele Dubrovner, the scribe, and Khaldik, the peddler, would speak in a language that was fitting for each of them” (M. Vintshevski), and thus he introduced naturalness into speech and as well into the acting of the players who had ceased walking around the stage with the old Shomer-Lateiner-Hurwitz pride. He created a school for the better Yiddish actors, and with gratitude and respect they performed all his plays, occasionally when it was at the expense of ticket sales. A strong personality, a widely educated man with an extraordinary sense of the stage from his very first play, later also with a firm dramatic talent—and moreover a high moral searcher and fighter for truth—Gordin was as if called to this historical mission in the Yiddish theater. With Mirele efros he launched a new epoch in Yiddish theater. This play, just as was the case with Got, mentsh un tayvl, Di kreytser sonata, Di shkhite, Khasye di yesoyme, Der unbekanter, and On a heym, have remained classic works in the Yiddish theatrical repertoire. With them Gordin wrote not only for the stage but also for literature. From 1895 to 1908, the best Yiddish theaters in New York—first among them, Jacob Adler and Kenny Liptsin’s (Thalia Theater)—performed Gordin’s plays, and Gordin throughout the years wrote his theatrical works especially for the actors in these troupes (Jacob and Sarah Adler, Dovid [David] Kessler, Sigmund Mogulesco, Morris [Maurice] Moskevitsh, Kenny Liptsin, both Thomashefskys, Berta Kalish, Bina Abramovitsh, Leon Blank, both Feinmans, and others). Many of Gordin’s staged productions had no success whatsoever, and they were removed from the repertoire. Others, such as Elishe ben abuye, for example, which was a failure in 1906, was revived many years later and performed with great success. Gordin’s final, highly work that gained success was On a heym, a play drawn from American Jewish life (it premiered in 1907 in the Grand Theater). Thereafter, Gordin, who was by this time quite ill, made a voyage to Europe with the goal of improving his health, and when he returned he staged (December 1907) his play Goles galitsye (Exile in Galicia) which was also dropped from the repertoire. This was, indeed, a difficult time for better works on the stage. Gordin was without a theater and, although he had already received $2000 for a work of his own, he nonetheless felt as though the earth had begun to disappear beneath his feet. “The great multitudes of newly arrived immigrants,” wrote B. Gorin, “were unable to digest high-quality drama, and the directors struggled ever so hard to win over a substantial audience to their side.” “The actors at the Thalia,” explained Bessie Thomashefsky, “were jealous of our intake; they turned art into prison, sent ‘God, Man’ to the ‘Devil,’ and began to deliver the goods to lowly popular tastes, to a worthy public, they claim.” Gordin’s last play was titled Dementya amerikana, oder der vanzin nokh gelt (American dementia, or the folly of money)—staged in Thomashefsky’s People’s Theater on November 26, 1908—and it garnered no success. In his last play Gordin raised the issue of the great boom in real estate (agitated prices for land and homes), which at the time had arrived suddenly in Brooklyn and the Bronx. The play was completely original, and it summoned great applause at the premier as well as from the critics of the entire Yiddish press in New York. It could not, however, be sustained on the stage—the audience did not materialize. “The failure of Dementya amerikana was a signal,” noted B. Gorin, “that the epoch of better drama had come to an end.” Gordin did not live long after this. He had suffered from cancer since 1907. Late 1908 to early 1909, he spent a short time in Beth Israel Hospital in New York. People then moved him to his home, and he died of a hemorrhage later that night. His last words were: “Finita la commedia” (The farce is over). His death aroused pain and sadness throughout the Jewish population in New York. Hundreds of thousands attended his funeral which began at the Thalia. In the Forverts (Forward) of June 12, 1909, Morris Rosenfeld wrote: “I see him tramping down over the streets like a palm tree. His aristocratic beard hangs with a festive honor over his wide shoulders; his eyes, like two bits of fire, sharp as the slaughterer’s knife; in his right hand, a wand, and in his left hand one of his plays.” In an editorial in the same issue of this newspaper, A. Liessin wrote: “One always expected greatness from him…. 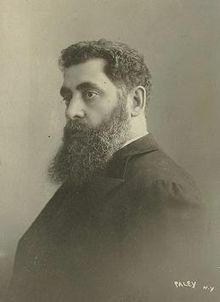 He was, however, a romantic, and this explains much about his career, full of misunderstanding and fate.” One can see that by “misunderstanding and fate” Liessin had in mind literary and personal conflicts as well, which for many years carried on between Gordin and Abe Cahan, editor of the Forverts. The conflict began in 1895 with the premier of Gordin’s play Der rusisher yid in amerike (The Russian Jew in America), in which he traced a Jewish union leader, Huzdak, a man who has sold his soul, who in the face of all the complaints of the laborers about their treatment in the union, always responds: “What do I need brains for when I’ve got a Constitution?” This very phrase became a classic itself. People called it “Huzdakism.” At the premier performance, Cahan exclaimed aloud in Russian from his theater box: “That’s a lie!” From that point forward, a conflict ensued between the formerly two good friends, which later developed into an open, long, bitter, but very serious and instructive debate concerning theater generally and Gordin’s writings in particular. The entire Yiddish press of the day became involved in the debate. Gordin polemicized with his adversary in the pages of Varhayt (Truth) and other newspapers and magazines, through his own journal Di dramatishe velt (The dramatic world) (New York, September and October, 1897), through his popular conversations with the audience at the theater between the acts of his plays, as well as through dozens of his public lectures which regularly drew hundreds of listeners. After his death, the Thalia mounted (on December 30, 1910) a surviving play by him, entitled Di mume fun varshe (The aunt from Warsaw), “melodrama in four acts with music from Rumshinsky.” Later still, in November 1918, Thomashefsky staged his second surviving play, Vilde kozakn (Wild Cossacks), “or Jews and Cossacks, Little Russian [Cossack] music by Y. Rumshinsky.” Neither play was a success. The former was never published, and the theme of the second was detailed in Y. Entin’s review of the performance (Varhayt, New York, December 3, 1918). It should also be possible to locate among Gordin’s remaining manuscripts the play Di kinder geyen (The children go), which has, however, till now not as yet been published. In all the years that Gordin devoted to his intensive and urgent writing for the theater, he also wrote stories which were published in a variety of Yiddish newspapers, such as: Arbayter tsaytung, Forverts, Fraye arbeter shtime (Free voice of labor), Di tsukunft (The future), and Varhayt, among others. In 1908 the publishing house of “The International Library” (A. M. Yevalenko) in New York published a volume entitled Yankev gordins ertseylungen (Yankev Gordin’s stories), 272 pp., with “a short notice” by Y. Gordin. The same publishing house in 1903—in its series “Lebns-bashraybungen fun barimte menshn” (Life stories of eminent persons)—brought out Gordin’s booklet Volter als mensh un denker (Voltaire as man and thinker), 32 pp. In 1910 the Hebrew Publishing Company in New York brought out the four-volume set Ale shriftn fun yankev gordin (All writings of Yankev Gordin)—vol. 1, 252 pp. ; vol. 2, 298 pp. ; vol. 3, 301 pp. ; vol. 4, 314 pp.—which included his stories, impressions, and sketches of Jewish life in the old country and in America, as well as his criticism, general thinking (“Troyerige gedanken” [Sorrowful thoughts], in vol. 3), and treatises concerning “Groyser velt-drama” (Great plays of the world) and “Drama un dramaturgn” (Plays and playwriting) in vol. 4. The first volume opens with an introduction by M. Vintshevski, “Yankev gordin der folks-lerer” (Yankev Gordin, the people’s teacher), 13 pp., which one can read even today with interest. In 1911 the publishers “Circle of Jacob Gordin’s Friends” in New York began bringing out (according to a subscription campaign) Yankev gordins dramen (The plays of Yankev Gordin). Only two volumes appeared (193 copies in a splendid edition): vol. 1 included Got, mentsh un tayvl, Elishe ben abuye, Der meturef, Safo (with a foreword by H. Zolotorof), and Oyf di berg (On the mountains); vol. 2 included Mirele efros (with a prologue in verse by M. Vintshevski), D kreytser sonata, Di emese kraft (The true power), Der unbekanter, and On a heym. With each drama the actors who appeared in the premiers are listed. The newspaper Tog (Day) in 1907 published Gordin’s one-act plays, and later that year there appeared in book form Yankev gordins eyn-akters (Yankev Gordin’s one-act plays), seventeen in all, 249 pp., with a preface entitled “Di oyfgabe un der tsvek fun eyn-akters” (The task and purpose of one-act plays) by Gordin’s son Alexander. One of these one-act plays—Der rusisher amerikaner farayn mit breyte idealn (The Russian American union with broad ideals)—Y. Entin translated from Russian. In November 1901 Suvenir (Souvenir) appeared in New York, “for Yankev Gordin’s ten-year jubilee” (40 large, densely printed pages). And, posthumously: Dray drames (Three plays) (Buenos Aires: Yoysef Lifshits fond, 1973), 317 pp. Gordin was also a community leader throughout the time he lived in New York. Just after his arrival there, he approached the Jewish social democrats who clustered around Arbayter tsaytung. When Morris Vintshevski in 1895 founded Emes (Truth) in Boston, Gordin was his closest collaborator on the newspaper and in the struggle that Vintshevski was leading in the Jewish wing of the Socialist Labor Party (S.L.P.). In 1897, Gordin, together with Meyer London, Yitskhok-Ayzik Hurvits, and others, was among the founders of the first branch of the Socialist Party (S.P. ), led by Eugene V. Debs. That same year, the society “Fraye yidishe folks-bine” (Free Yiddish people’s theater) was founded in New York, with the goal of working toward a better Yiddish theater, and Gordon soon became the soul of this new organization—with his lectures as well as with his energetic organizational activities. He later founded the Educational League, and for many years he devoted his talent, temperament, energy, and will power to this organization. In the first years of the Forverts, he was one of the main contributors to the newspaper. Between 1901 and 1906, he together with M. Vintshevski took an active part in campaigns on behalf of the Bund in Russia. In April 1908 he was a member of a group that was mailed an invitation to the historic language conference in Czernowitz. Sources: There exists no complete listing of all the plays by Yankev Gordin. B. Gorin lists sixty-three of them in his Geshikhte fun yidishn teater (History of the Yiddish theater), vol. 2 (reprinted in Zalmen Reyzen’s Leksikon, vol. 1); a list of his published plays in Yiddish and in translation into other languages, as well as a list of the majority of his staged plays, can be found in Z. Zilbertsvayg, Leksikon fun yidishn teater, vol. 1; this can also be found in the book Yankev gordin by K. Marmor (New York, 1953). Gordin’s dramatic works have been translated into Russian, Polish, Hebrew, English, German, Ukrainian, Hungarian, Italian, and Spanish. Films have been made from his plays, and they have also been performed on the radio—see Yankev Mestl, “Yankev gordins pyesn in film, radyo un af farsheydene shprakh” (Yankev Gordin’s plays in film, radio, and in various languages) and N. Mayzil, “Yankev godin af rusish, poylish un hebreyish” (Yankev Gordin in Russian, Polish, and Hebrew), in Marmor’s book, pp. 209-26. The literature on Gordin is extremely rich and diverse. Bibliographies of this literature have thus far been compiled by Zalmen Reyzen in his Leksikon, vol. 1; Z. Zilbertsvayg in Leksikon fun yidishn teater, vol. 1; Shmuel Niger, Dertseylers un romanistn (Storytellers and novelists) (New York, 1946), pp. 93-203; Niger, in Algemeyne entsiklopedye (General encyclopedia), “Yidn H” (New York, 1957), pp. 120-21; Y. Yeshurun, in Fraye arbeter shtime (New York) (May 22, 1953); Yeshurun, in K. Marmor’s book, pp. 227-41. To these bibliographies should be added: Di briv fun and tsu yankev gordin (The letter from and to Yankev Gordin), published by Moyshe Shtarkman, in Yivo-bleter (Vilna) 3.2 (February 1932) and Fraye arbeter shtime (May 22 and June 19, 1953; January 1 and 29, 1954); Dr. Y. Shatski, in Yivo-bleter 38 (1954), pp. 303-12 (exchange of letters between Gordin and the British journalist Simeon Stronsky and the American poet Edward Markham). As yet unmentioned in all the above bibliographies: A. Volf-Yosni, in Letste nayes (Tel Aviv) (August 21, 1953); E. Shulman, in Frayland (Paris) 2 (10) (June 1954); K. Marmor, in Yidishe kultur (New York) (July 1954); Y. Turkov, in Yidishe shriftn (Warsaw) 5 (85) (1954); H. Rogof, Der gayst fun forverts (The spirit of the Forverts) (New York, 1954), pp. 103-4; Y. Sh. Herts, Di yidishe sotsyalistishe bavegung in amerike (The Jewish socialist movement in America) (New York, 1954), pp. 74, 124; Yankev Glatshteyn, in Idisher kemfer (New York) (October 8, 1954); Y. Entin, in Tsukunft (New York) (December 1954 and January 1955); L. Kobrin, Mayne fuftsik yor in amerike (My fifty years in America) (Buenos Aires, 1955), pp. 285-93; Dr. A. Mukdoni, In varshe un in lodzh (In Warsaw and in Lodz), vol. 1 (Buenos Aires, 1955), see index; Y. Rodak, Kunst un kinstler (Art and artists) (New York, 1955), p. 58; N. Mayzil, ed. and comp., Amerike in yidishn vort, antologye (America in the Yiddish word, an anthology) (New York, 1955), see index; A. Dimov, in Tsukunft (November 1957); Dr. A. Foyrshteyn, in Hatsofe (Tel Aviv) (Kislev 1957); Dimov, Dos yidishe vort (Santiago, Chile) (December 20, 1957); A. A. Roback, The Story of Yiddish Literature (New York, 1940), pp. 168-72; Y. Grudberg-Turkov, Goldfaden un gordin (Goldfaden and Gordin) (Tel Aviv, 1969). Translator’s note. This cannot have been the entirety of Renan’s five-volume work, but most likely a selection from it.